Over the years, Petswelcome has written numerous articles about pets and cold weather, offering tips on what to do when the frigid temperatures hit (see links below). But it’s been a few years and, with the recent deep freeze in the Northeast (where we are located), we thought we’d revisit the topic again to offer additional steps you can take to ensure your pet remains safe and healthy during the winter season. Old habits die hard and it’s easy to maintain your usual routines with your animals even though the seasons have changed. Winter requires a different mindset than spring, summer and fall and it’s important to be aware of, and adjust to, the challenges each season presents. When it comes to below-freezing temperatures, a wrong decision or mistake might lead to a more dire consequence than it would in milder conditions. 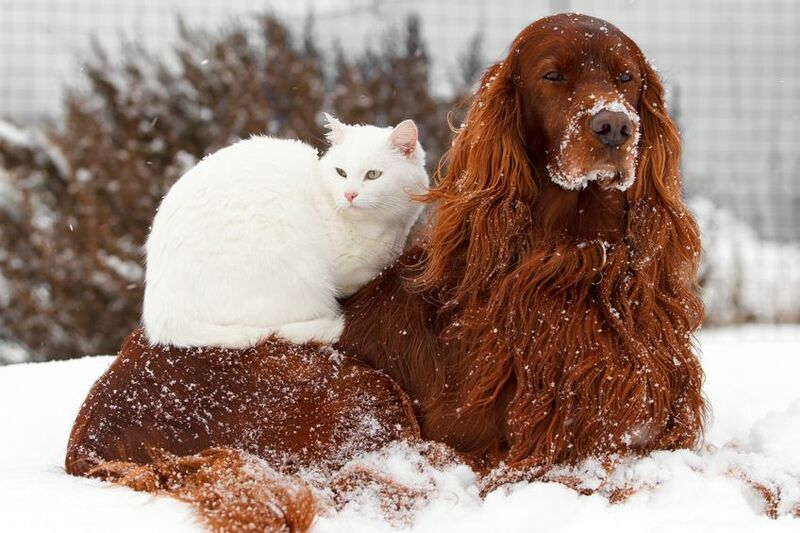 Cats, puppies and short-haired pets should come inside when the temperature goes below 40 degrees. For these pets we highly recommend that you consider a coat or sweater to help keep them warm whenever you do take them outside. When the weather drops below 20 degrees, even outdoor pets should be brought indoors. If you have a long-haired dog, make sure that it is well-groomed as matting lessens their ability to keep warm. We recommend that you walk dogs on a leash in cold weather so that you have control over their exposure. Also, it will ensure they will stay clear of hazardous locales such as frozen ponds, lakes or streams. If you rely on an electric fence, it’s important to be extra vigilant and check that it is working properly, as cold weather can wreak havoc on electronic equipment. Also, in many areas, town plows and other heavy-duty vehicles can breach property lines and break the underground wire that keeps dogs aware of their boundaries. While a broken fence is bad any time of year, it’s worse in winter because colder temperatures and snow-cover offer less olfactory “landmarks” to a dog thereby increasing its chances of getting lost. Keep a close eye on animals around space heaters, wood burning stoves, fire places and electric blankets as they can cause serious burns. And though it might seem like a nice idea, do not place dog beds near a fire place or wood burning stove because an errant spark or even minor contact could cause a fire. Carefully monitor your dog’s diet. Studies have shown that canine metabolism changes during winter, causing dogs to consume more food to keep warm. However, many house pets get less exercise in the winter so, if you do increase their portions, consider a low calorie/low fat option so they do not gain excessive weight. In many parts of the country, winter is a time of wonderful extremes, when the contrasts between darkness and light, cold and warmth, sleep and wakefulness are more conspicuous and the complexities of everyday life are reduced to primary needs and simple joys. Sitting in front of a fireplace with your dog or cat while the snow is flying is one of those joys. By taking a few commonsense steps to ensure your pet’s health and safety, we hope you will find similar contentment and peace with your pet during this most beautiful time of year.